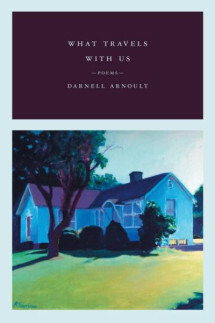 With a story-teller’s timing and the emotional range of a singer, Darnell Arnoult in her debut collection offers readers a stirring string of poems about the people of Fieldale, Virginia. A planned community founded in the Virginia foothills by Marshall Fields in the early 1900s to support his textile mill, Fieldale was populated by transplanted Appalachian mountain folk. Arnoult herself grew up there, a third-generation resident but among the first generation to leave. She took away with hser the oral history of her home, and in What Travels With Us she captures in poetic form the townspeople’s voices, both remembered and imagined. Personal, poignant, and witty, Arnoult’s poems look back as they move forward, demonstrating how we are always creating ourselves anew from the experiences we carry with us.